The indispensable tool for the Massachusetts adult beverage trade. As fall slips into the early days of winter, beer drinkers slide from the maltiness of the Oktoberfest season into the arms of something more bracing. For some, this change in the seasons calls for whiskey or strong wine. For others, imperial stouts, barleywines, and double India Pale Ales. In the early days of craft brewing, when brewers began releasing seasonal beers to bring something new and exciting to the market during the slow winter sales months, the beers of choice often involved malt and spice. These so-called Winter Warmers covered a wide swath of styles, including Wassails, Old Ales, and sometimes even India Pale Ales. The all-encompassing moniker generally pointed towards more complex malt flavors but not necessarily involving the escalating levels of alcohol found in boozier barleywines. The season often called for beers with dullish auburn hues and boasting sweet malt notes ranging from caramel and molasses to treacle and toffy. They may have been lightly spiced or possessed of candied fruit notes. As with the change in American television programming, seasons no longer seem to matter for the beer consuming public. 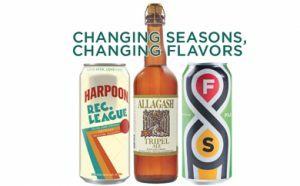 Novelty and change are built directly into the everyday experience for many consumers and they have little interest or patience in waiting months for brewers to finally drop a new beer or two. With word-of-mouth can releases and coast-to-coast beer trading, brewers are deluged with calls for the new shiny thing. In most places, the response is hops, hops, and more hops. Blast out a dozen new India Pale Ale variants in tall boy cans every month? Consumers are into it. But that does not mean that people may want a break from the rat race of lining up at the local brewery for their weekly allotment of a handful of pale ale cans. For those thoughtful consumers, let’s take a look at a few beers worthy of the season, including one hazy beer for those who cannot let go of the juice. One of Harpoon’s newest releases is also one of its most promising in a long time. Buoyed by an eye catching, colorful can design, a sharp name, and a story to tell, Harpoon’s Rec. League is a fun beer. Brewed with sea salt, buckwheat and chia, the story of these ingredients would by themselves be worthy of a look. But really, it is just a very tasty beer. Long happy to rely on its successful stable of stalwart beers, such as its decidedly old school IPA, Harpoon has been a little slow to innovate. Visits to the company’s popular tap room can certainly yield some new rewards but when it comes to releasing new beers to the public, it often left most of the heavy lifting to its 1OO Barrel Series. 2O18 saw some more activity on the innovation front, with the Juicer releases, a series of experimental New England style India Pale Ales released in 16 ounce pounder cans. These beers showed promise but also a touch too much restraint. The restraint ended, ironically, with Rec. League, one of Harpoon’s lowest alcohol releases. Brewed to only 3.8 percent, this hazy pale ale pours with a substantial dollop of off-white foam and a deep luminous and hazy amber-orange hue. The aroma contains a surprising blast of citrus and tropical hops mixed with straight juice and a light drying note. The body is a touch on the thinner side of medium, understandable considering the very low alcohol by volume, but remains solid and avoids being thin. The flavor brings a light wave of more tropical and fruit juice followed by a quick run of sweet pale malts. There’s a beautiful softness to the beer, a light airiness that compels another sip. Rec. League is an exciting new entrant into Harpoon’s lineup as it branches out from its reliance on its more traditional lineup. Many breweries are releasing hazy and juicy beers but few are trying it on the lower end of the alcohol spectrum. Rec. League puts aside Harpoon’s easily identifiable house yeast and instead adopts an English strain more typical of today’s hazy beers. Originally scheduled to be a one-off batch, the response has been positive and it will make a comeback in a January mix pack and perhaps in fuller release next year. AVAILABLE FROM Harpoon Distributing, Atlas Distributing, Horizon Beverage Company, and Merrimack Valley Distributing. I had the chance to visit Fair State in Minneapolis a few months back and was presented with a beautiful pint of its signature pils. So it was great news when I learned that Fair State would be entering the Massachusetts market and bringing this classic lager with them. A traditional German style pilsner, it is brewed with a single hop, Hallertau Mittelfruh, one malt, and lager yeast. A deceptively straightforward recipe for such a delicious beer. The Fair State Pils has a radiant deep golden hue and a considerable white dollop of foam that laces beautifully with a long, slow pour. The aroma is clean, crisp, noble hops mixed with slight hints of grass and the faintest hints of sweeter malts. The aroma is pleasant but is not the real draw here. Take that first sip. I chose a slow pour, which creates a softer texture. The result was a quick hit of pale European pils malt followed by quick flits of sweet fruitier malt notes followed by a long, deliberate, grassy and earthy herbal hop note that draws on long after the sip is complete. Pleasantly bitter but not overwhelmingly so. The fast hit of malt is quickly beaten back by the earthy noble hops resulting in a highly drinkable classic. AVAILABLE FROM Craft Brewers Guild. For those winter minded consumers interested in enjoying a beer with an elevated alcohol content and also a pleasing spiciness to make up for the lack of Winter Warmers, the classic Tripel from Allagash is an often overlooked gem. Brewed in the strong golden ale style of Belgium, Tripel is produced with Nugget and Hallertau hops and fermented with cane sugar. The resulting beer will fill you with seasonal cheer. It pours with a huge boom of pure white foam, well sustained and prodigious. The color is worth stopping over, with a lightly hazy and luminous maize golden hue. The aroma is a mix of spicy yeast, banana and candied fruits, mild alcohol, and generally an inviting kind of fun. For such a substantial alcohol level, the beer is surprisingly light in body but otherwise packs plenty of flavor, ranging from herbal, biscuit, and alcohol notes. A true pleasure with food or just as an accompaniment by a warm fire. AVAILABLE FROM Craft Brewers Guild.